The wait is over. Finally, Central Board of Secondary Education (CBSE) has released the application forms for much-awaited NEET-UG 2017 exam. The NEET (UG)-2017 will be conducted on Sunday, the 7th May, 2017. 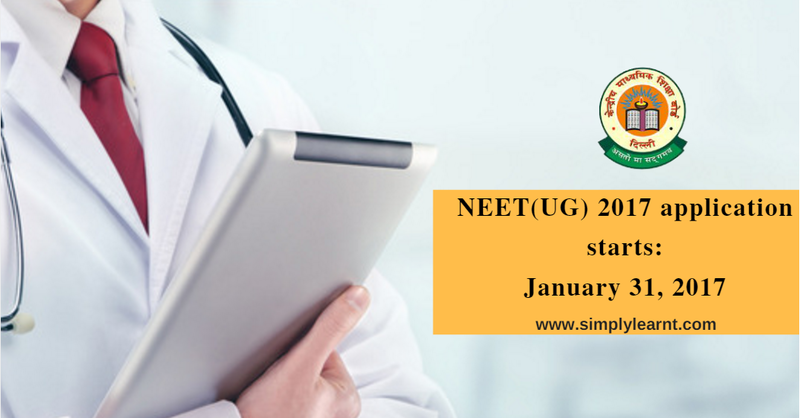 NEET-UG is held for providing admissions in MBBS/BDS courses offered by all government and private medical colleges in India. It is a one tier exam, commences once in a year in month of May. From the year 2016 onwards, NEET exam has replaced AIPMT exam. All seats (MBBS/BDS) of any medical/dental college will be filled by the score of NEET examination only. Candidates can check latest updates about NEET 2017 including application form, exam dates, fees, exam pattern, eligibility syllabus & seat reservation. Aadhaar Card: Aadhaar card is mandatory for all candidates except belonging to Assam, J&K and Meghalaya state. Age Limit: Minimum – The minimum age limit is 17 years on 31st December of the year of admission. Maximum – The maximum age limit is 25 years for general candidates and 30 years for reserved categories. Attempts: Candidates may attempt the exam only 3 times until cross the maximum age limit. Qualification: Students must have passed/appearing 12th or equivalent examination from any recognized board with Physics, Chemistry, Biology/Bio-technology or any other elective subject with English. Online process: Candidates can pay the fee through credit/debit card/net banking/e-wallet using online payment gateway.